I paused posting here for a bit due to a two-week trip to the US for work. No cocktail-making going on for me while I travel. I’m back in the saddle again at home though, so here we go. The Café de Paris cocktail looks like a pretty weird drink to me (and to others as well). The fact that it is yet another anise drink doesn’t help with me either. I dug around to find out a little more about this one, and it appears to go pretty far back to a Brooklyn, NY hotel, which opened in 1909. You can get a more detailed history over on the Cocktail Quest blog. Regardless of its history, this drink does not read like a delicious concoction, and unfortunately that hits the mark. All three recipes are the same for this one. Again, I used absinthe instead of anisette since that’s what I have on hand. I’ll start by saying that this drink wasn’t as bad as I though it could be.That said, it was just bleh. It doesn’t have any real flavor to it at all. 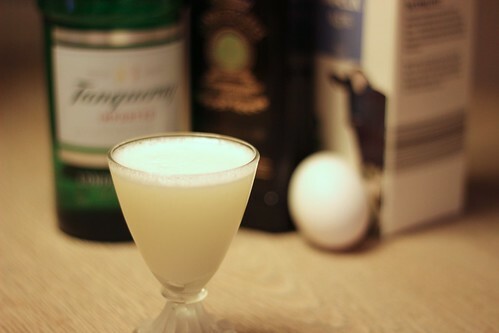 The egg white and cream just seem to dumb the gin down, without anything else to really balance it out. The anise flavoring is pretty subdued as well. This cocktail needs some sweetness, or bitters, or something. It wasn’t horribly offensive, but I ended up dumping the drink half way through. Life’s too short to drink bleh cocktails.